Thank your contributors in a most heartfelt way. 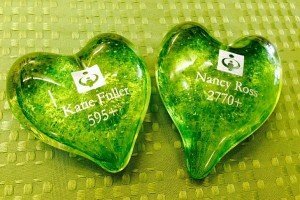 Solid glass heart-shaped paperweights can be engraved with your logo or message. Contact us to special order, glasssales@avalonglassworks.com, 206-937-6369. Hearts are approximately 3″ wide by 1″ tall.